Original blue wraps bound in blue cloth. Report Of His Majesty's commissioners appointed to inquire into the Military preparations and other matters connected with the war in South Africa. 4 Volumes [Cd.1789., 1790., 1791. & 1792.]. London 1903.viii + 316 pp, xii + 534pp, x + 720pp, ii + 445pp. 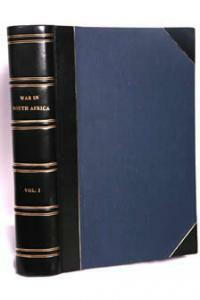 The report of ther Elgin Commission appointed to inquire into the military preparations for the war in South Africa, and into the supply of men, ammunition, equipment and transport by sea and land in connection with the campaign, and into the military operations up to the occupation of Pretoria. The Commission sat on 55 days to take evidence and heard 114 witnesses among whom were Gen. Sir Redwers Buller and Field Marshal Earl Roberts, together with many other senior officers, civil and military. Numerous documents bearing upon the proceedings are reproduced as appendices. The volume is fully indexed. viii + 316pp. The Commission sat in the last quarter of 1902 & continued up to June 1903. It was officially empowered to 'inquire into the Military preparations for the War in South Africa, and into the supply of men, ammunition, equipment and transport by sea and land in connection with the campaign, and into the Military operations up to the occupation of Pretoria'. In Kipling's words the Boers had given the British army ' no end of a lesson ', and the commission was set up to probe the army's failure in the first part of the campaign & to gauge its preparedness for a European war. All the prominent commanders (and a number of middle-ranking officers), including Lord roberts and Kitchener, were summoned to give evidence before the Commission. the cut-off date was May 1900, but in practice much of the evidence spread over the entire duration of the war. Aside from being extremely informative & providing a detailed view of the inner mechanisms of a vast Imperial expeditionary force, the submissions are often exhilirating & dramatic. There are many tense & fierce encounters across the commissioner's table, with men like Buller & Gatacre fighting to salvage their floundering reputations.